There is one theme, however, on which, it seems to me, Mason mishandles his own method, namely, the religion of the Judaeans: their god, temple, priests, oracles, and so on. On the Judaean side of the conflict, Mason treats religion as an anomaly: extreme, irrational, and unusual, not to be invoked by way of explanation if simpler, more realist, more human factors (e.g., ambition, self-preservation) are on offer, as they always are. But I would argue that for the Jews, as for ancient peoples generally (though not for us moderns), nothing was more realist or more human than religion. For just this reason, they often expressed other, ostensibly more realist ideas in the language of religion. By their lights, military intervention by the Parthians was not a different, simpler outcome than salvation by a god. The former just was the latter. Interestingly, on the Roman side, Mason does allow for the tremendous importance of gods, priests, and sacrifices as social facts (see 139-155, especially 152-153). But he does not extend this courtesy to the Judaeans, perhaps on the assumption that their god has been given rather too much credit for the war already (see 199). Not entirely irrelevant -- Novenson is himself a committed Christian of a somewhat conservative leaning, I have been led to understand from his apparent close working associations with scholars like N.T. Wright and Larry Hurtado. The Kindle edition on amazon is £8.11. ...when we, as historians, are not translating ancient texts, issues of translation policy need not determine how we write about the Ioudaioi of antiquity (or about Roman citizens in Macedonia). And it seems clear to me that many of those Ioudaioi were primarily defined as such by their common descent and/or allegiance to their religion — and that, accordingly, “Jews” is the most appropriate English term for them, just as “Judeans” best fits many others..
Interestingly, on the Roman side, Mason does allow for the tremendous importance of gods, priests, and sacrifices as social facts (see 139-155, especially 152-153). But he does not extend this courtesy to the Judaeans, perhaps on the assumption that their god has been given rather too much credit for the war already (see 199). Isn't that like trying to compare steam trains and bacteria? The problem is that the same word is used interchangeably for ethnic Judeans living in Judaea as well as those living elsewhere. I think it was Fabian Udoh who spoke of Judeans as members of an ethnic group (those descended from Judeans in Judea, wherever they may be). This is why Hyrcanus II was "demoted" to ethnarch (guardian of the interests of Judeans everywhere, but particularly was in charge of their temple and its sacrificial services). Herod had this designation, as did Archelaeus and later Agrippa II. I think in some periods no ethnarch was appointed, but the duties probably fell primarily on the High Priest and the Temple administrators. These appear to have supervised the lease of temple lands in Judea (e.g., the tithe income, "inheritance" of ancestral land, etc. ), so the temple had a function similar to "temple states" in Asia Minor and to an extent in Egypt. I was not so welcoming of the idea of using Judeans for all Judeans, whether resident in Judea or not, but as I looked into it, it seemed to indicate that ethnicity was by far the factor for whether one was a Judean or not. In Judeans and Jews, Daniel Schwartz has devoted an Appendix to the argument by Steve Mason re 'Judeans'. Appendix: May We Speak of ‘Religion’ and ‘Judaism’ in the Second Temple Period? Having argued throughout this volume that the Second Temple period was witness to the rise of a religiously oriented Judaism, which (wherever it was found) was essentially diaspora orientated, and that it is appropriate to use ‘Jews’ to refer to those characterized by such an orientation, in contrast to those characterized by a land-state, and nature-centered orientation, for whom ‘Judeans’ is more appropriate, I should relate to an original, erudite, and challenging study published in 2007, in which Steve Mason argued that ‘there was no category of ‘Judaism’ in the Graeco-Roman world, no ‘religion’ too’. As he explains at the outset of the article, this thesis is meant to justify his preference of ‘Judean’, rather than ‘Jew’, as the appropriate translation of Ioudaios in Josephus - as in the volumes that have so far appeared in the series that he edits, FJTC. 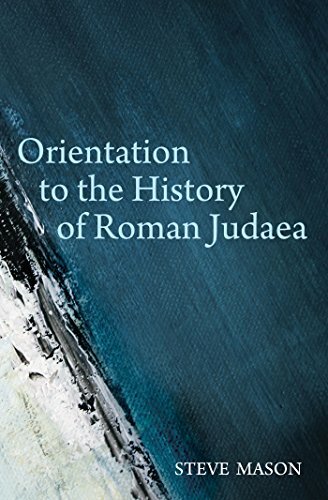 In the body of what follows, I will argue that the categories of both ‘religion’ and ‘Judaism’ did exist in the Graeco-Roman world, at least by Josephus’ day. As noted at the outset of this appendix, Ioudaios in ancient texts is at times best rendered by ‘Judean’, at times by ‘Jew’, Ioudaismos, however, is a much rarer term, and what I have suggested is that we should leave it where we found it: associated with usage of Ioudaios of the latter type. The fact that it is rare means, apparently, that it witnesses to a process that began in the period that saw the word appear - the Hellenistic period - but was far from complete: the move from being ‘Judeans’ to being ‘Jews.’ That process, however, although not so far along in Judea (which explains how Jews there, even a couple of centuries after the composition of Second Maccabees, were capable of starting something that is appropriately termed a ‘Judean’ war against Rome), was most natural and to be expected and understood among Ioudaioi such as the author of Second Maccabees, who were Jews of the Hellenistic Diaspora. For such Ioudaioi, despite whatever memories they maintained of a past elsewhere, and despite whatever hopes they may or may not have held for a future elsewhere, were not ‘Judeans’ in the only sense the English language, according to its most respectable authorities, ascribes to that term: natives or inhabitants of Judea. Rather, they were ‘Jews’ - what those authorities and common usage define as a matter of descent and/or religion. Of course, the relevant issue here is what influence Jewish religion had on the move towards war with Rome. If, like Steve Mason - re the quote from Novenson - '.....on the Roman side, Mason does allow for the tremendous importance of gods, priests, and sacrifices as social facts (see 139-155, especially 152-153). But he does not extend this courtesy to the Judaeans', then is not something lost that might well be relevant to understanding that time period? An interesting collection of articles re the Jews vs Judeans issue. The collection is available for download in various formats. Various scholars, including Steve Mason and Daniel Schwartz, respond to an original article by Adele Reinhartz. Let us restore Judean to its primary geographical meaning, as pertaining to the region of Judea and its residents. Political designations such as the Judean People’s Front, the People’s Front of Judea, the Judean Popular People’s Front, or the Popular Front of Judea would also be appropriate, as per one authoritative source (see Monty Python’s Life of Brian). Let us not make the mistake of defining Jews only in religious terms. Let us rather understand the term Jew as a complex identity marker that encompasses ethnic, political, cultural, genealogical, religious and other elements in proportions that vary among eras, regions of the world, and individuals. Let us not rupture the vital connection — the persistence of identity — between ancient and modern Jews. And let those who nevertheless elect to (mis)use Judean to translate all occurrences of ioudaios justify their usage beyond merely footnoting others who have done so. Never, in regard to this reoccurring theme, does Mason consider the immediate parallel that must have been on the mind of any statesman or serious military leader in the Mediterranean world: the Hasmonaean revolt. After all, in the not too distant past, a group of Jews with neither an army nor a king had taken arms against the world power of their time -the Seleucid kingdom-and in a gradual process carved for themselves the strongest local kingdom of the day, with an army, a king, wealth, and territory. When Mason pronounces that "absolute freedom has not been possible in Judaea for centuries" (546), he forgets that Alexander Jannaeus reigned there less than 150 years prior.